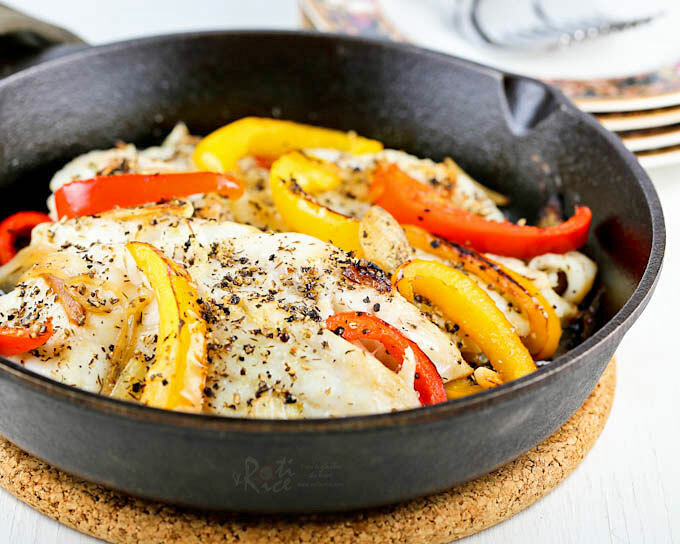 Healthy and delicious Broiled Cracked Pepper Cod with sweet bell peppers, onions, and garlic. 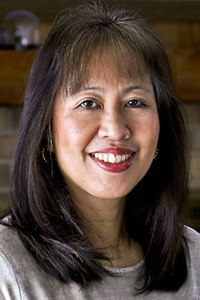 Serve it with rice or potatoes for a tasty weeknight meal. Pound for pound, fish contains more water as compared to other meats. For this reason, fish feels “lighter” and is perfect for the warmer months. Best of all, it takes only minutes to cook. 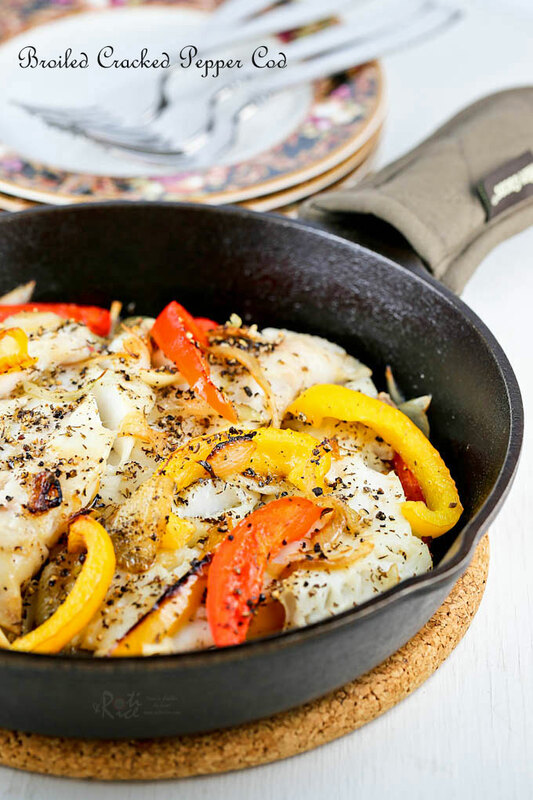 This Broiled Cracked Pepper Cod is a dish I concocted recently and it is fast becoming a favorite at our house. The cod is simply flavored with dried thyme, coarsely cracked black pepper, and sea salt. Bell peppers, onions, and garlic are added to make it a one-pan dish. I served the fish with brown rice but baked or mashed potatoes would also be delicious. Please feel free to use any kind of preferred fish fillet. Trout, tilapia, and salmon will all work. Cooking times may differ by just 2 to 3 minutes depending on the thickness of the fish. Smash black peppercorns with a meat pounder. Set aside. Sprinkle thyme and salt on both sides of fish. Heat 1 tablespoon olive oil in a cast iron skillet. Cook onion, red and yellow bell pepper for 2 minutes. Add garlic and continue to cook for another 30 seconds. Transfer half the vegetables to a bowl. Place the fish on top of the remaining vegetables in the pan. Then spread the vegetables in the bowl on top of the fish. Sprinkle cracked black pepper and drizzle remaining tablespoon of olive oil over the fish and vegetables. Broil the fish in the preheated broiler until the flesh turns opaque and white, and the fish flakes easily, about 8 to 10 minutes. 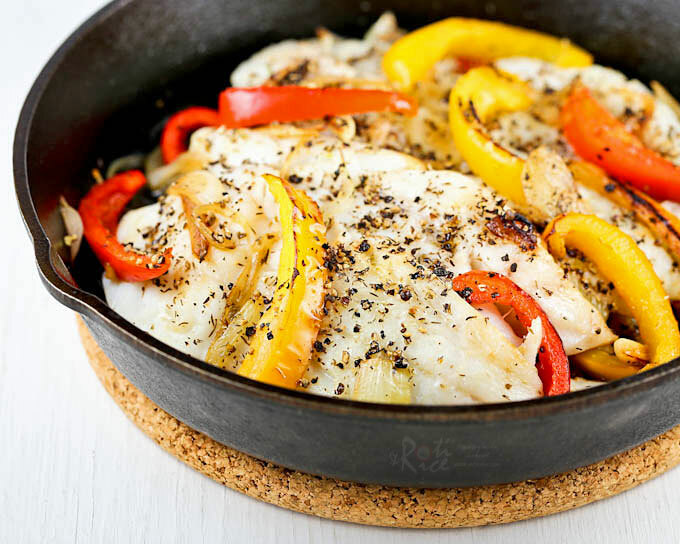 This quick and tasty Broiled Cracked Pepper Cod is great for busy weeknights. Do give it a try. Is the broiler on high or low? My broiler only has one setting. It is most likely high.